Sprouting provides healthy nutrients from your own kitchen throughout the winter. Living in Canada in the winter, it can be a struggle to obtain fresh living foods that haven’t travelled thousands of kilometres before they get to your kitchen. The importance of eating nutrient-dense plant foods is well documented in helping us stay healthy. They help to lower cholesterol and blood pressure, boost our immune system, increase energy and aid in cellular renewal. Sprouting, which is the process of germinating seeds to be eaten in a raw form, is a simple and inexpensive way to obtain an excellent source of nutrient-dense food throughout the cold Canadian winter. Doing it yourself makes these delicious foods even tastier. These sprouts (pictured, right) are an excellent source of chlorophyll and a synergistic combination of vitamins A, C, D, E, and B-complex, along with calcium, iron and phosphorus. They also contain a powerhouse of enzymes that aid in the digestibility of the sprouts and help to the body to utilize the nutrients they contain. 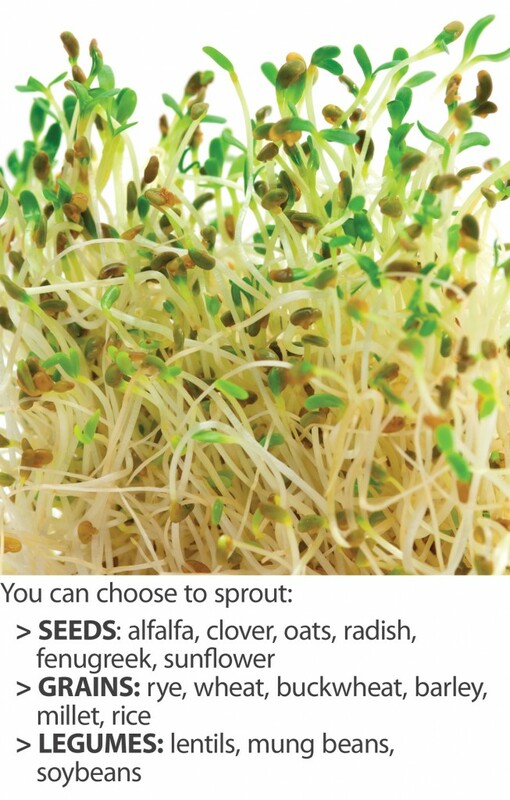 Adding sprouts to your diet also helps to maintain the body’s acid/alkaline balance. A diet high in animal protein and processed foods creates an acidic environment within the body that can lead to disease. Increasing your intake of fresh and natural plant foods like sprouts helps to increase the alkalinity of your body, lowering your risk of disease. Even if you are not an avid gardener, all you need to sprout seeds in your kitchen is the right seeds, fresh water, a mason jar and some cheesecloth. You can obtain organic seeds for sprouting from most health food stores or farmers’ markets, or you can order on-line. One of my favorite seed combinations is a Sandwich Booster available from sprouting.com that blends clover, alfalfa, radish and non-GMO canola. -> Place one to two tablespoons of seeds in a mason jar and cover the opening with cheesecloth, securing it with a rubber band. Rinse the seeds once or twice, discarding the water after rinsing. Refill with about one cup of fresh water and soak the seeds for approximately six hours. -> Discard the soaking water, rinse once or twice more, and then drain the water. Prop the jar upside down at an angle in a bowl. Keep the jar in a warm spot on your kitchen counter and continue to rinse the seeds every morning and night. Within three to six days the seeds will sprout and you can enjoy these tasty nutrient-dense plants. Once the sprouts are ready to be eaten, place them in a sealed container in the fridge. You can add sprouts to salads, sandwiches, even smoothies. For a delicious sandwich, use whole grain bread or a wrap with hummus, thinly sliced cucumbers, tomatoes and a handful of sprouts. For a salad that is sure to please, combine grated beets, carrots and apple, top with feta cheese and sprouts and add a dressing of flax oil, lemon juice, tamari and grated ginger. The fact you “made” the sprouts yourself will make it all the tastier!